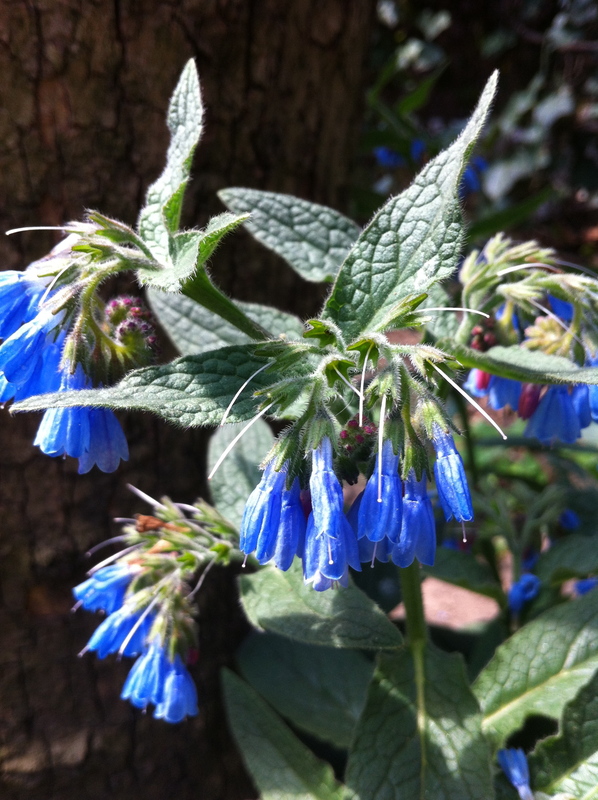 This entry was posted in Mystery Plants, Spring and tagged Mertensia, Ornamental Comfrey, Symphytum, Symphytum grandiflora 'Hidcote Blue', Virginia Bluebell. Bookmark the permalink. This simple process of fermentation renders this plant into a very good fertilizer for all plants. What’s more, it actually seems to like being cut time and time again and grows back vigorously with each cutting. Wow – thanks for this great reminder! I had read about this in a great book called ‘Garden Anywhere’ by British author Alys Fowler. I just checked, and she says that two common wild forms, Symphytum officinale, Symphytum asperum, along with ‘Bocking 14’ – a Russian cultivar – make great brewed fertilizer. She doesn’t mention my ornamental variety though…maybe I can experiment with one of them to see if it seems to work. The leaves of the wild forms she listed are enormous…in the photos of her holding them they look to be about 12″ wide and 24″ long – each! Hi Donna! We might just be able to do that! I have two of these comfreys, and they’ve both grown substantially this year. I read that you divide them, so perhaps this fall will be the time to do that? My husband and I are getting a car next week and will finally be able to take some trips outside the city. Who knows – maybe one day I can head up your way and we can trade! Btw, it’s wonderful to have you back in the blogosphere! Your enthusiasm has really been missed. Aw, shucks! What a sweet thing to say – thank you! Life just got very busy lately, fortunately in many good ways which I’ll be sharing soon, but I have definitely missed catching up with all the great blogs I’ve come to love so much. Now that I’m caught up I’m hoping to stay on top of posting and reading. I’ve got oodles of Mertensia and it’s ephemeral. Is the comfrey also, or does it stay until frost? Hi Kylee! 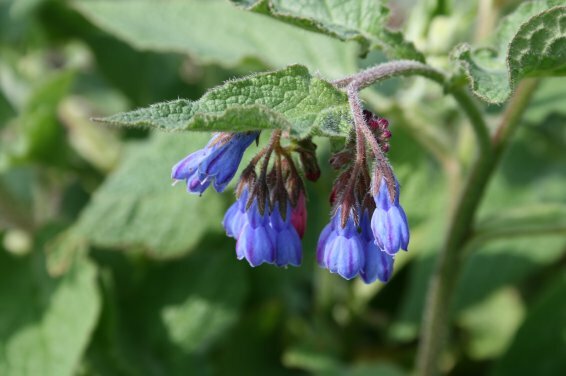 The comfrey is not ephemeral…those lovely velvety leaves stayed THROUGH frost this year. It was such a mild winter that I’m not sure if this is normal or not, but the foliage stayed all winter long right into spring! Now see, that’s a HUGE advantage then over the Mertensia! Awesome! Any blue-flowering plant deserves serious consideration–that one is a beauty Aimee and sounds like it is being quite polite in your garden! Agreed! I am partial to blue and purple flowers in the garden. So far so good with the comfrey! 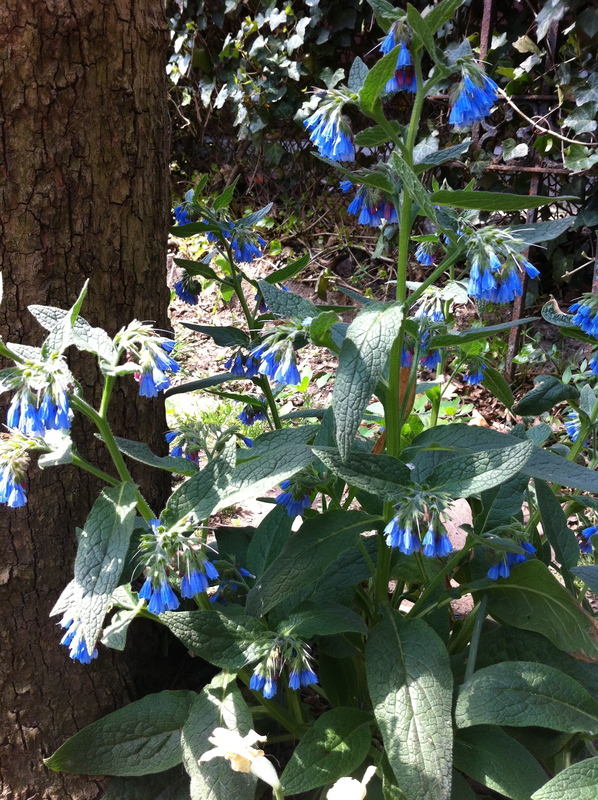 If it helps, comfrey is furry and semi-evergreen; Virginia bluebells are NOT furry and ephemeral. 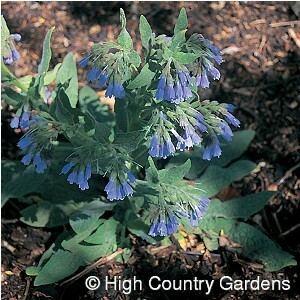 I’d call comfrey aggressive rather than invasive, but once it settles in, it does spread vigorously. Remember the old saw about perennials. The first year they sleep; the second they creep; the third they leap. Give it three years before you decide if it’s a thug! I planted it in a shady, clay spot hoping that will slow it down a little bit.